I first learned how to make calabacitas a couple years ago. I shared a traditional recipe for calabacitas on my other blog, but wanted to put a spin on it! 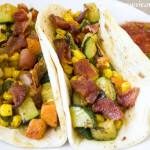 So today, I am sharing how to make calabacitas breakfast tacos! Calabacitas translates into “little squash”, and is a combination of squash, peppers and onions. You can add whatever else you want into the mix, your favorite veggies, herbs and spices, or whatever you have in your fridge that needs to be used up! This is a great dish to make at the end of the week, when you haven’t gone grocery shopping, but want a warm meal! I am calling these breakfast tacos, because I have added bacon into the mix, but you can make these calabacitas breakfast tacos for any meal of the day. 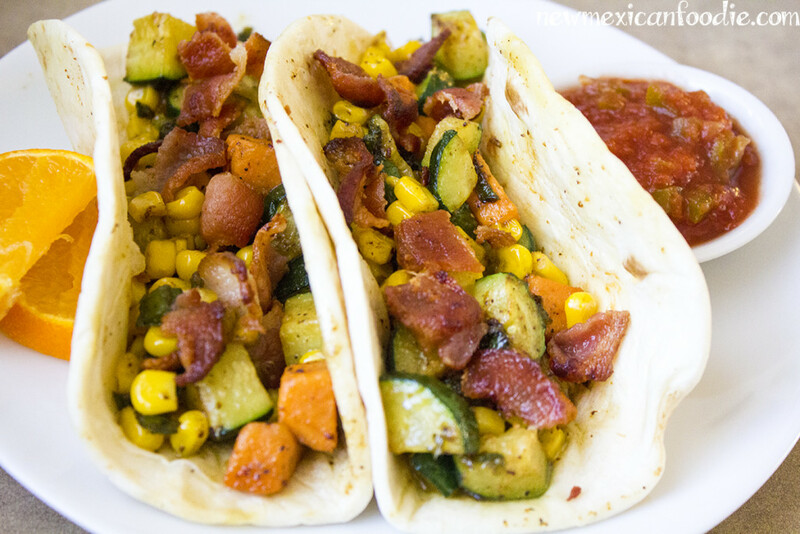 For my calabacitas tacos, I included zucchini, corn, cubed sweet potatoes, jalapenos, onions and garlic. I cooked bacon until crispy, crumbled it, and added them on top. If you want to make this a vegetarian dish, just leave out the bacon. I love this combination of veggies, because they can all be grown in the New Mexican climate. Every summer, I plant a small vegetable and herb garden, where I grow squash, zucchini, tomatoes, jalapenos and lots of green chile. Corn, onions and sweet potatoes all grow well here, too, so I love that this dish includes local ingredients. Cooking this recipe in the middle of winter gives me a little taste of summer to brighten up the cold, snow days. Here is take on how to make calabacitas. Modify the recipe to work for you, and your preferences, and I know this will be a warm, comforting dish that you’ll make again and again. 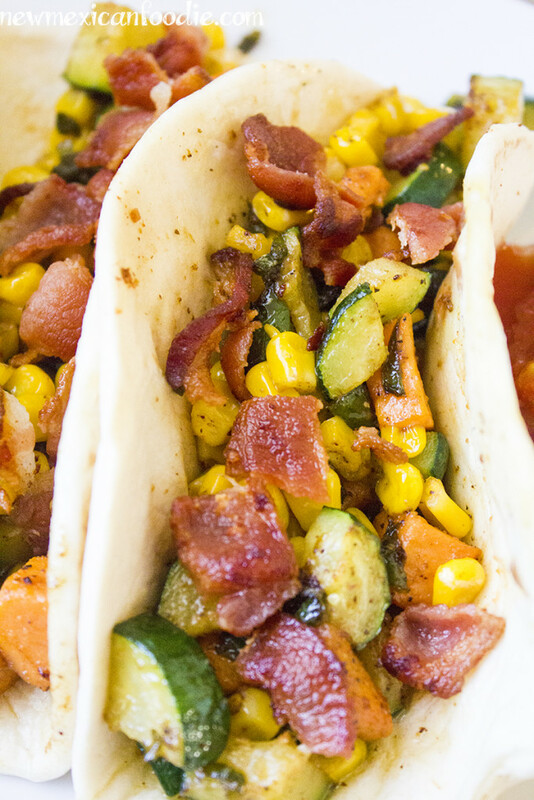 Breakfast tacos take a unique twist when filled with savory calabacitas and bacon! Cook bacon in a pan until crisp. Once cool, crumble and set aside. Meanwhile, bring a pot of water to a boil. Cook cubed sweet potatoes for 5-8 minutes, or until soft (but not mushy). Remove all but 2 tbsp. of the bacon grease from the pan. Cook onion and jalapenos over medium-high heat until translucent, about 6-8 minutes. Add in garlic, zucchini and cook an additional 5 - 8 minutes, or until zucchini are starting to soften. Add in cooked sweet potatoes and corn, stir to combine, and cook an extra 2 minutes. Soften flour tortillas on the stove top or in the microwave. Fill with calabacitas, and serve with salsa. Have you ever tried calabacitas? 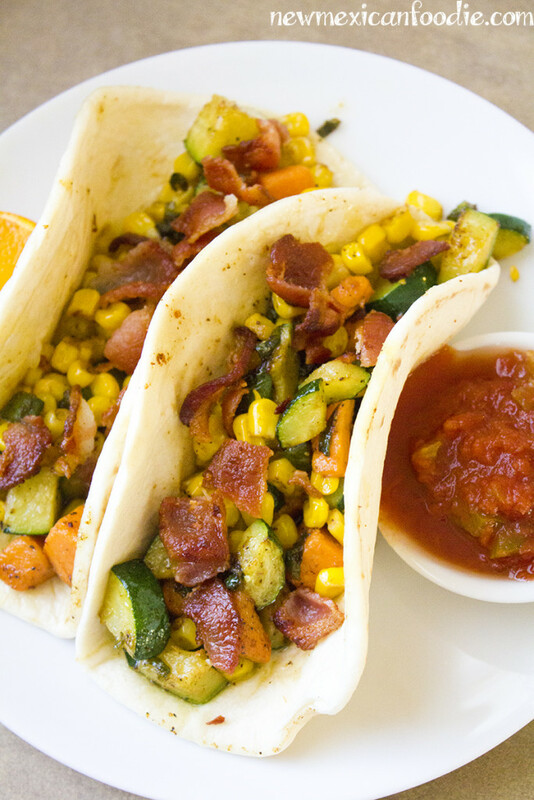 Leave a comment telling us what veggies you add to your calabacitas!